One of the interests of the Military Collection are Panoramas and besides acquiring the Garibaldi Panorama as a gift in 2005, the collection owns numerous small panoramas on paper. 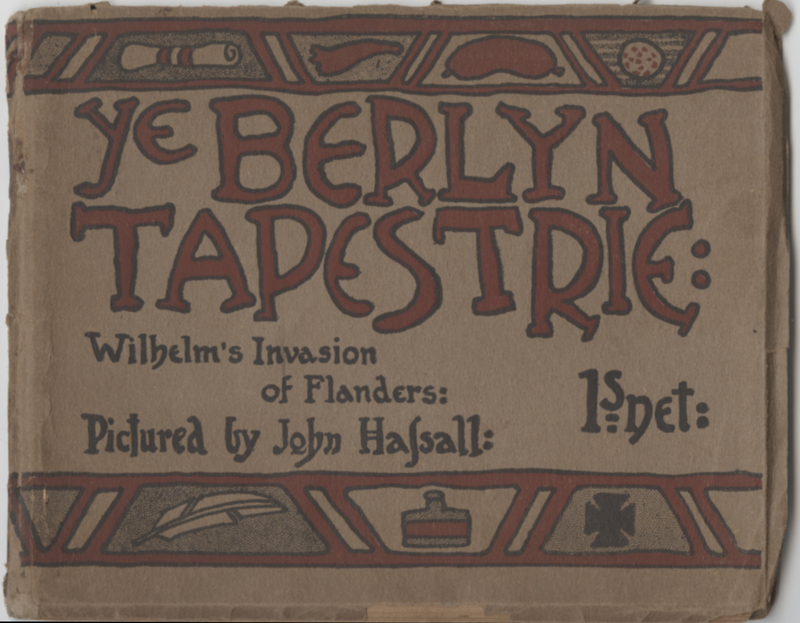 A recent addition is the humorous Ye Berlyn Tapestrie. Modeled after the famous Bayeux Tapestry which records the events leading up to the Norman Invasion of England and the culminating Battle of Hastings in October, 1066, this latest panorama was made in London in 1915 at the height of World War One. Printed by Edward Evans Ltd in ‘Ye Studio Offices’, it was the work of the well known illustrator, John Hassall (1868-1948). This is a red and black printed panorama measuring 135 x 4,625 mm, consisting of five sheets conjoined. These are folded into decorated printed paper wrapper covers 140 x 172 mm. In all, there are thirty scenes in this leporello style of binding. 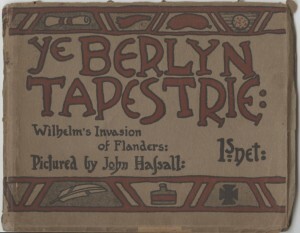 The dealer’s catalog describes this as a ‘comic panorama drawn in the manner of the Bayeux Tapestry, depicting the Kaiser making preparations for the Great War, the invasion of Belgium and North France, the deliberate destruction of churches and hospitals, the arrival of the British forces, the digging of trenches, the sinking of neutral shipping, the use of submarines, balloons, and aeroplanes, and the liberal awarding of iron crosses. Every stereotypical anti-German sentiment [is] included’. Other images include the bombardment of Reims Cathedral, poison gas and the chemists experimenting to create it, as well as a sinking ship which can be interpreted as the Lusitania on May 7, 1915. Jens Meinrenken, a German researcher, suggests that the colors used in the printing parody the German Empire and its symbols, ‘especially the characteristic spiked helmets, the Imperial Eagle and the Iron Cross’. The artist represents the German soldiers as ‘doltish, gluttonous, inhumane and uncivilised’, reaffirming the popular image then circulating of the alleged atrocities committed by them in Belgium in August and September 1914. Source: Jens Meinrenken, ‘The Deadly Face of War – John Hassall’s Ye Berlyn Tapestrie‘; paper presented at the Imperial War Museum conference, August 2011, Comics & Conflicts. Stories of War in Comics, Graphic Novels & Manga. This entry was posted on Friday, March 29th, 2013 at 10:11 am and is filed under Collection Update, Special Collections, Uncategorized. You can follow any responses to this entry through the RSS 2.0 feed. Both comments and pings are currently closed.